I wrote a facebook post yesterday about my dad who passed away 11 years ago. 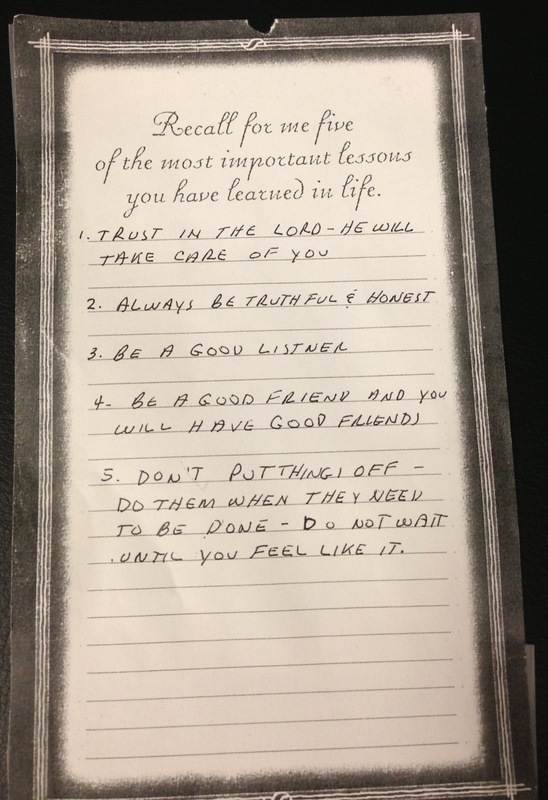 After writing that post, I came across a sheet of paper (with his handwriting) of five of the greatest life lessons he’d learned in life. He instilled these in me growing up and I hope I do half as good with them as he did. A photo of that sheet of life-lessons is below. Here’s a copy of the post from Facebook: My dad HV Rutledge passed away 11 years ago today. I still miss him so much on so many levels. I’m thankful for the example he set for me: he honored my mom for the 49 years they were married / he always provided for his family / he was the most honest man I’ve known / he had an incredible work ethic / he chose to follow Jesus at 17 / he served our country in the Navy in WW2 / he loved & served his church & pastor / he was trustworthy / he was an incredible friend / he was a great example to my kids and loved them like no other / he was a great dad and my hero & mentor. I miss you & love you dad.